High-dynamic-range imaging is a photography technique that involves taking multiple images at different levels of exposure, and then combining them into a single image containing a greater amount of detail. Photoshop is the usual program for turning photos into HDR images, but it's not the only option. EasyHDR Pro (35 Euros, 46 USD on the date this review posted) is a stand-alone application that retails for a fraction of the price and lets you create HDR images using a number of sophisticated options. Despite packing plenty of features, it is easier to use than Photoshop because it is purpose-built for HDR. EasyHDR aligns and combines multiple photos into a single HDR image, and then lets you change the color-balance curve and other parameters to get the exact look you're after. To begin using EasyHDR Pro, you're going to need at least three photographs of the same exact scene, taken at different exposure values. I've tried the application with both JPEG and RAW images, and RAW images produced significantly better output: JPEG compression produces noticeable artifacts and noise when images are overlaid on top of each other. Ideally, you should use a tripod when taking the images, and use a camera with an auto-exposure bracketing feature. With AEB, you depress the shutter button just once, and the camera takes three images in rapid succession, each with its own exposure value. The three resulting images should be identical in composition, and different only in exposure (which affects the details visible in the scene). That means moving objects are a no-no. Once you have your images, import them into EasyHDR. The application easily handled the CR2 RAW files out of my Canon 350D camera, requiring no conversion. After loading all three images, EasyHDR displayed a dialog entitled "HDR radiance map generation." As you may have noticed, HDR photography is chock-full of technical jargon, even more so than regular photography. Even if you're not familiar with all of the terms, EasyHDR provides enough visual feedback (and sensible default options) to let you figure things out by trial and error. For example, you can leave all options in this dialog set to default, and simply click Generate HDR. EasyHDR then crunches some numbers, and after a short pause, shows a combined image composed of information from all three images. 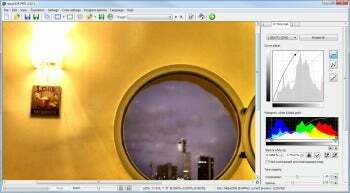 You can then make radical changes to the HDR image by tweaking its color curve or moving several tone mapping sliders, such as compression, gamma, and saturation. These options are all quite powerful and intuitive, but one area where EasyHDR falls significantly short of Photoshop is its lack of Undo functionality. For instance, let's say you change the color curve but then regret it and want to go back; pressing Ctrl-Z would not be of much help at this point. You're going to have to try to remember what the curve looked like, and change it back manually, or else save often and reload the previous copy as needed. This can be very frustrating, especially when performing a complex series of editing operations. If you're just looking to get into HDR photography and don't own a Photoshop license, EasyHDR Pro offers a great way to get started. EasyHDR lets you produce stunning high-dynamic range images with an easy-to-use, professional interface.